Irina Dress Boutique: Guest Post from Emily C.
Today Emily Carnes from Trainin' to Texas is my guest poster! My name is Emily from Trainin' to be a Texan. I am so excited and honored to be guest posting for dWa while she is out visiting colleges! In honor of her college visits (and possible job interviews), I wanted to share some super cute interview outfits/tips with you. My husband and I moved to Texas (from Georgia) shortly after graduating from college, and I immediately had to start the interview process. And now, we'll be moving BACK to Georgia this coming summer, so I'll be out in the interview world once again. I don't consider myself a style expert b any means, but, I have had my fair share of interviews, so I'll share my opinions with you! Are you as obsessed with Pinterest as I am!? I would love to follow your boards and see what you pin! Not totally sure about the watch on this one, but I LOVE the skirt...and the ear rings! 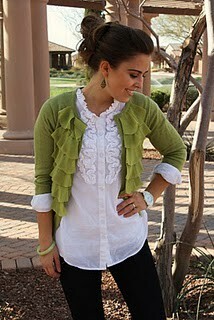 So I'm not totally in love with ALL of this outfit, BUT pair the ruffle shirt with a color pop (via. cardigan) and I think it would be beautiful! Love this whole look. It's good to not go crazy with jewlery, and to be conservation--but, it's SO IMPORTANT to keep your own personal style. So, don't be afraid to add that pop of color! Love the white/green combo. I'd maybe put a skirt wth it! I LOVE everything about this look. And of course, I would put a cardigan over it--maybe an animal print to play off of the red!? What are you favorite interview outfits!? Don't be afraid to be yourself with dressing for an interview. Give them something to remember you by! Thanks again, dWa, for allowing me the opportunity to guest post! I love every opportunity to meet new friends!